Cultivate your energy to very high levels with these meditations. Each week we will experience a variety of meditations including some taught to me by Master Hong Liu in Los Angeles and Dr. Yang, Jwing-Ming in Boston. Meditations will include guided visualizations, toning, and many others developed by me over the years. No prior experience needed. This class will be simulcasted live during my Rochester live class. Participants will not be on-screen but will have easy access to writing in questions through the chat feature of the webinars. 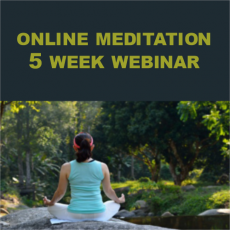 Those registered for the 5 week programs will have access to recordings of every class to review at home as well as access to the live broadcast of each class online. Thursdays 1:30-2 pm beginning May 9, 2019.